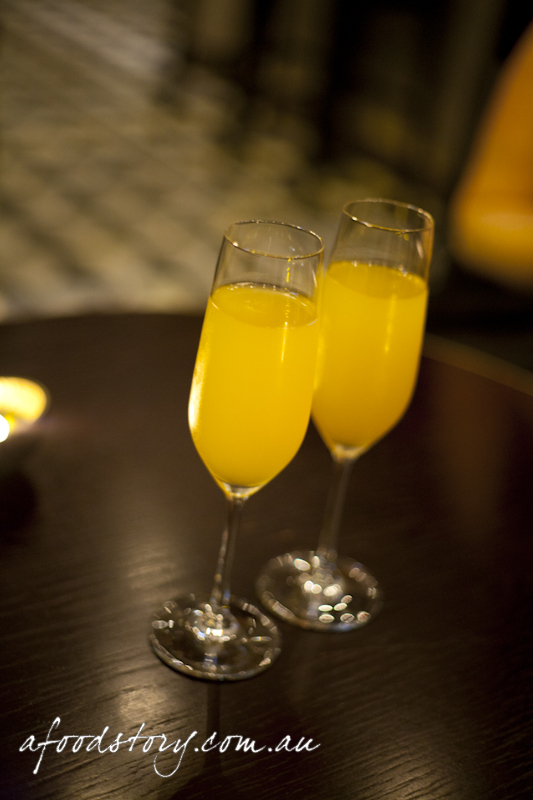 Ever since our first adventure at Sepia during Crave SIFF last year we have wanted to return and experience all that Martin Benn and his exceptional team have to offer. Mr O was hassling us all to book it in and in the end we caved and told him to book it. 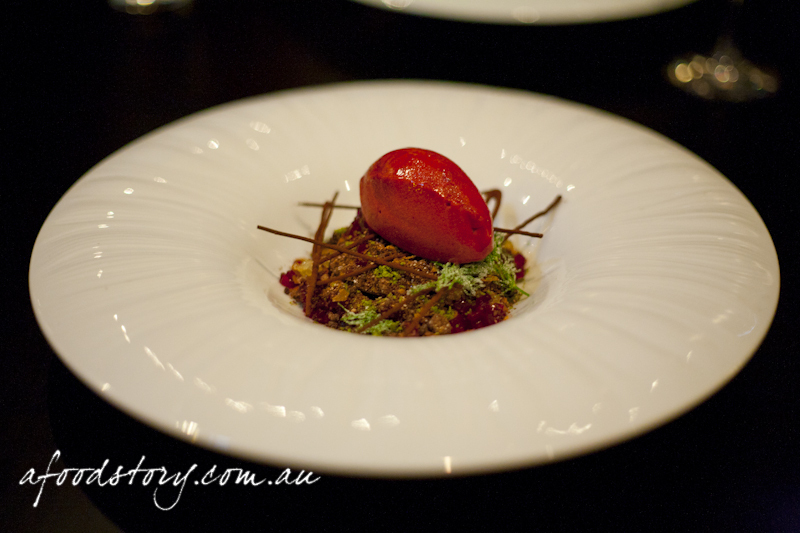 During the months waiting for our booking the menu was put under the microscope and general consensus was that we should go with the seasonal four course menu and not the degustation. We arrived a little early and decided to have a cocktail in the bar to start the evening. The girls went for the peach nectar Bellini, Mr O chose a Negroni and I just could not go past a Martini with Tanqueray ‘Number Ten’ and olives. Along with our drinks a bowl of nibbles arrived, they disappeared quite quickly, and then it was time to move over to our table. 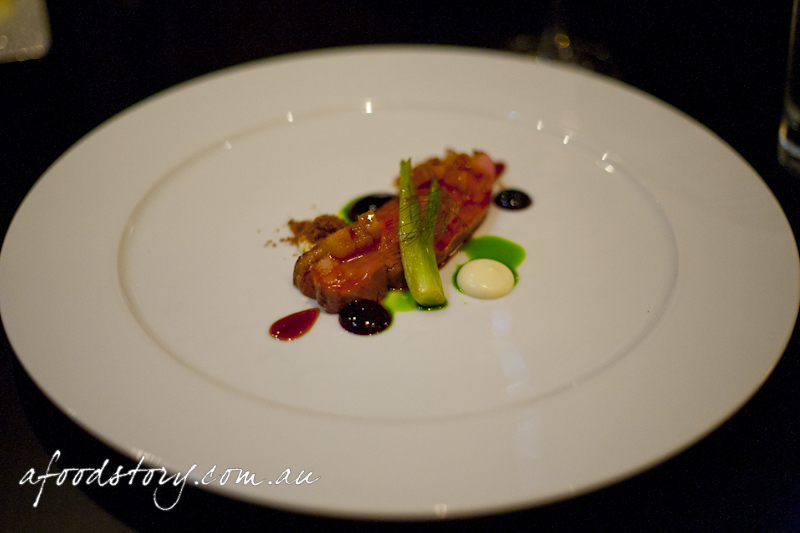 When presented with the menus for the evening I was pleasantly surprised that the menu was different from what we had seen online and the degustation was looking to be the perfect choice. After some discussion and persuasion it was locked in, we were going all out with the dego and matched wines. Woot! 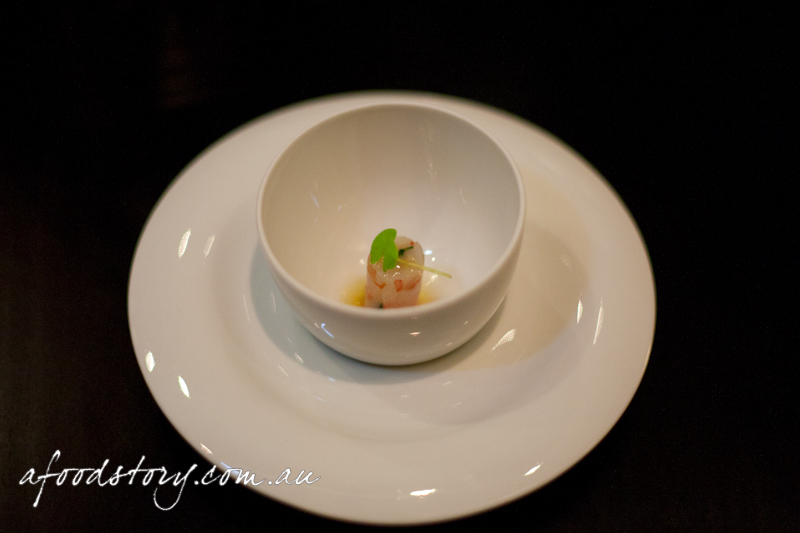 Amuse bouche – Crystal Bay prawn, Jamon, basil. 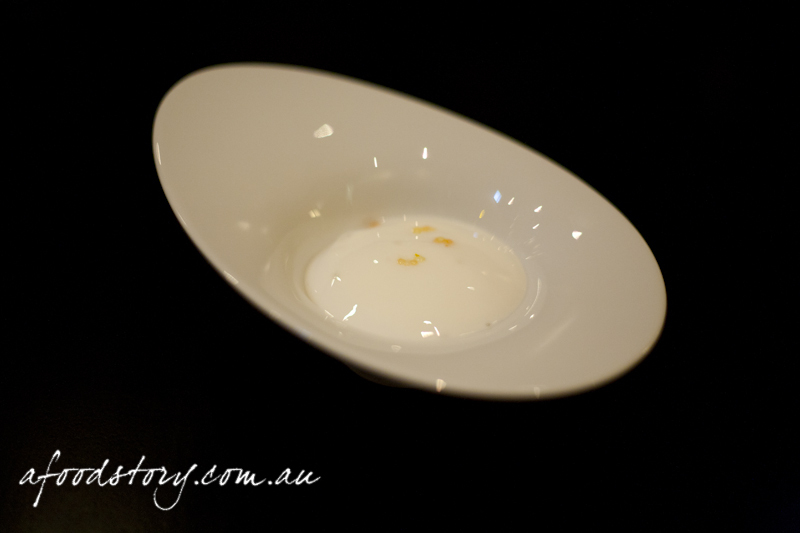 To kick it all off our first dish off the menu was the amuse bouche of crystal bay prawn. Everyone had timed it so well that they were all in the bathroom when the dish arrived and was explained. Lucky for them I have a great memory and was able to recount the explanation to them. A lovely soft prawn with an intense basil infusion tipping this away from a wholey seafood dish to something with a great little herbaceous edge. 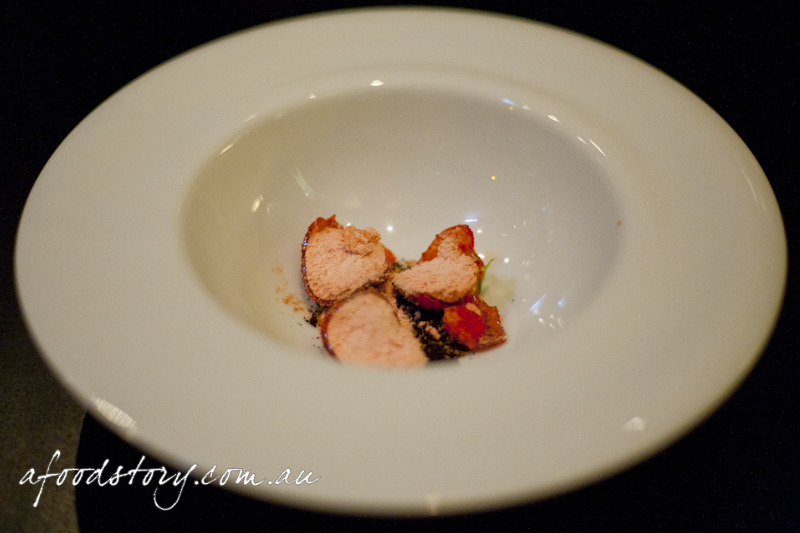 Loved the broth with a rich and lightly smokey jamon feel to it and loved and the visual impact of the dish. Poached Spanner crab, Hijiki seaweed, green tomato and lemon verbena, heirloom tomato mousse, basil. Hakutaka ‘Gokujo’ Junmai-Daiginjo, Hyogo, Japan. The tomato egg looked stunning. Perfectly formed with a precise sprinkling of tomato powder on top. The egg was made from a tomato consommé; shaped using balloons that had been filled with the tomato consommé liquid and dropped into liquid nitrogen (though they don’t want you knowing all of their tricks, our waiter let slip a few trade secrets). Inside the egg was a gorgeous heirloom tomato mousse that went so well with the basil. Although there was a great intensity from the many layers of tomato, the spanner crab was never allowed to be outshone. Delicate and sweet with a wonderfully firm texture the spanner crab was able to compliment every element in the dish, even the thin slices of Hijiki seaweed that added a nice salty finish. “Scallop sushi” – Nori rolled sea scallop, avocado cream, pickled ginger, puffed sushi rice. 2008 Dr Loosen ‘Graacher Himmelreich’ Riesling Kabinett, Mosel, Germany. 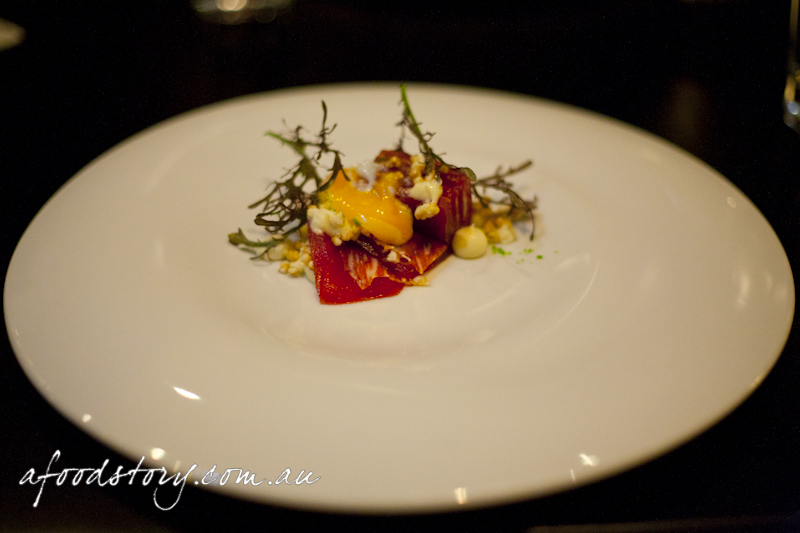 I don’t think any of us could hold in our excitement to have this dish again (we first tasted it at a Crave SIFF event in 2011 ‘The Chef, the Young Chefs and the Chemist.’) Not being on the degustation menu had caused much heartache. Just as before, the scallops were so impeccably cooked I was in heaven. The avocado was just ever so creamy, the pickled ginger jelly possibly even better than before and the puffed sushi rice just crunched away in perfect sync. Love. 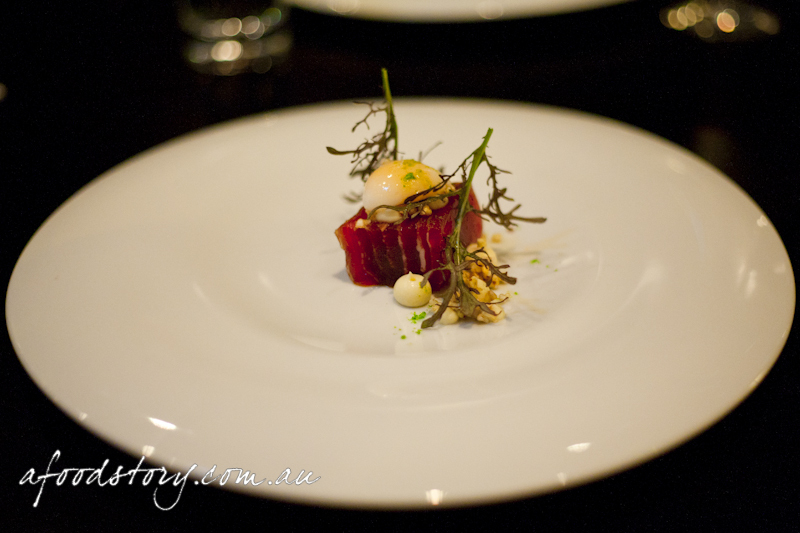 Sashimi of Yellow Fin tuna, Jamon Iberico, poached quail egg, white soy jelly, dashi onion cream, Tasmanian wasabi, puffed buckwheat, red elk. 2009 Millton ‘Te Arai Vineyard’ Chenin Blanc, Gisborne, New Zealand. While we were all busy chatting away my second most anticipated dish of the night arrived. Sashimi of yellow fin tuna may be one of my ALL time favourite things (who’d have thought it – 5 years ago I wouldn’t go near raw fish). As it was plated my first thought was ‘whoa that is a big cube of tuna’ and then secondly ‘hey where is my damn jamon’. 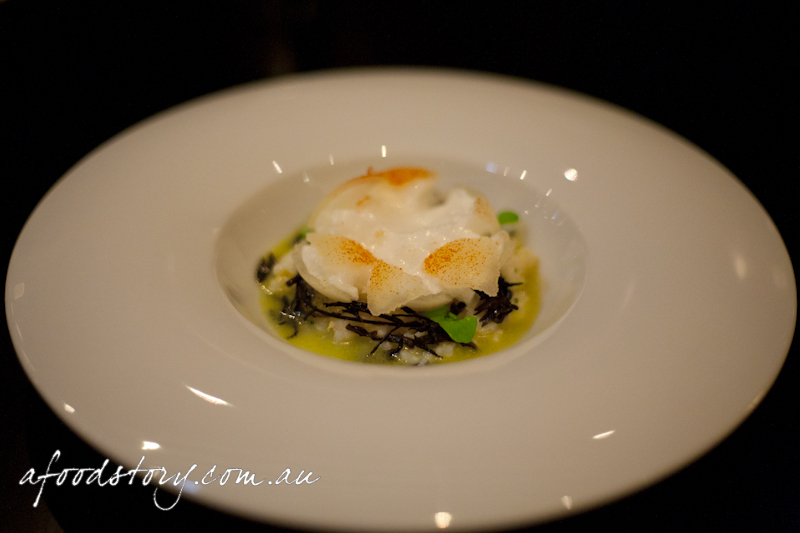 My first task was to pierce the delicate poached quail egg and let it ooze out over everything. As I brought my knife up to the tuna and pushed at what appeared to be the sinew lines in the tuna I was absolutely in amazement. Best food moment ever to discover that the jamon was so faultlessly layered between the tuna to appear as sinew. It stopped me in my tracks. As expected this dish was truly impressive. The quail egg was a nice balance not being too strong to overwhelm the softest tuna I have ever eaten, or the wonderful salty jamon. I was in heaven and this became the best dish I have ever eaten! Scampi tails cooked over Japanese charcoal, miso Hiramasa kingfish, shellfish custard, crystallised wakame, dill pickled cucumbers, smoked trout roe, shiso. 2009 Domaine Rolet ‘Naturé du Jura’ Savagnin, Arbois, France. The shellfish custard was such a rich orange colour and crazily intense in shellfish flavour, but ever so light in texture. The scampi was buttery soft with a sweet smokey feel balanced out with the pickled cucumber and the sweet salty kingfish. As always the pop of the roe was textural bliss but adding a smokey undertone gave the dish a little more complexity than expected. A faultless dish with the only issue being my apparent intolerance for this much shellfish in a single dose. With a reaction much the same as I had at Bilson’s last year. Note to self: get an allergy test one day. 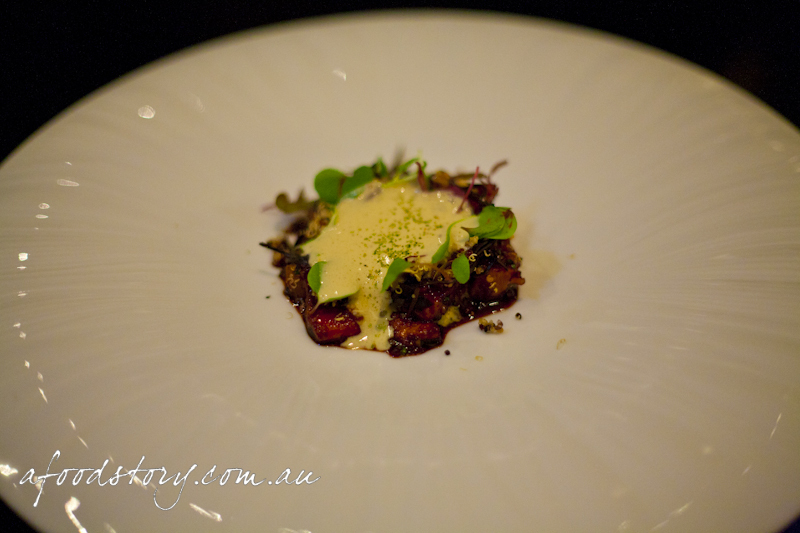 Soy glazed smoked freshwater eel, amaranth grain, sea urchin cream, arame seaweed, sorrel, nori and orange. 2009 Niepoort ‘Tiara’ Gouveio Rabigato Codega, Douro, Portugal. The eel had been a point of contention for Lex and Mr O as it was the reason Lex had been put off the degustation menu and was more looking forward to the seasonal four course menu. But after a few arms were twisted and our awesome waiter had mentioned it was his favourite dish on the menu Lex caved and it was the degustation all the way. Sea urchin was an ingredient I had never tried so I was personally looking forward to the eel and all the elements that the dish comprised of. Almost right away it was the smoked eel that dominated the senses. Sweet and salty from the soy glaze, a firm and familiar eel texture and a smokey taste that really let itself be known. I was surprised with the sea urchin cream being so silky and almost sweet and the tiny hints of orange that kept the smoke level in check. Roasted Aylesbury duck breast, sheep yoghurt and apple, honey blackcurrant, fennel, ginger and sansho spiced crumb, Fuyu persimmon caramel. 2011 Zaccagnini ‘Ikebana’ Novello Rosso, IGT Colline Pescaresi, Italy. Last visit to Sepia had Lex singing the praises of Daniel Puskas’ (now of sixpenny) Aylesbury duck. And this time around she was lucky enough to get another duck hit. While there may have only been a single slice of duck and its glorious layer of fat on the plate, there was nothing lacking about it at all. Once again the duck was cooked with such precision that the flesh was crimson red and it tasted just as good as it looked. Sheep yoghurt and apple combine beautifully to create a sharp acidic duo that is so much more than each individual element, a real food pairing perfection. One element that took everyone by surprise was the persimmon; so inconspicuous but ever so present in the dish, the tiny cubes had the texture of semi dried apple but tasted of everything else in the dish, just a little sweeter. Char grilled pastured fed beef fillet, nameko, roasted buckwheat cream, flowering garlic chives, roasted mustard seeds, salt and vinegar potato starch. 2009 Bonny Doon Vineyard ‘Contra’ CG GR MO PS ZF SY, Central Coast California, USA. 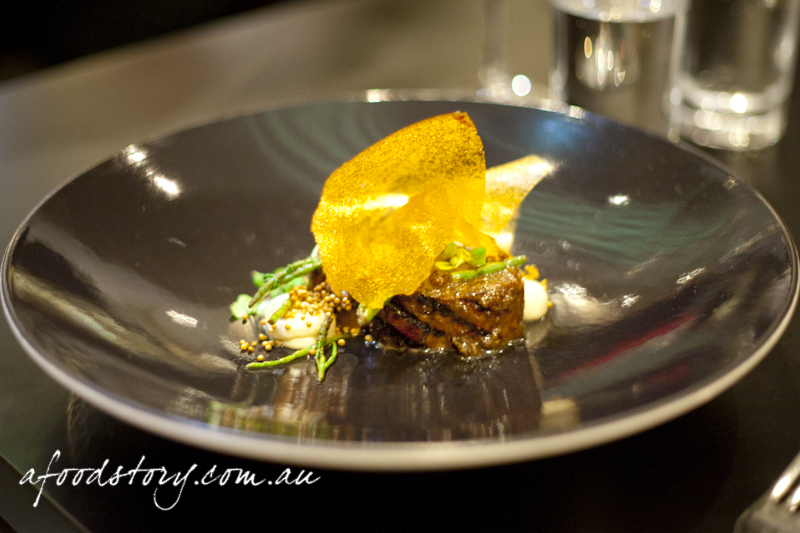 There were so many things going on in this dish that I love – BEEF, mustard, salt & vinegar – I just could not wait to see what the team at Sepia had done with the dish. Sitting prominent was the salt & vinegar crisp of potato starch. Translucent, crunchy and oh so very salt and vinegary, it was a great way to start. My first cut into the beef revealed a medium rare delight that almost didn’t need to be cut but instead pulled apart. Mustard and steak always go but the toasted mustard seeds added something a little special to the normal mustard and beef pairing. And the icing on the cake was Lex’s dislike of mustard meaning I was gifted the rest of her beef that she could not finish (more beef for me, a match made in heaven?). Lillet Vin aromatisé Rosé, Bordeaux, France. After the beef and a nice break from eating another special little treat made its way from the kitchen to us. To our surprise a frozen strawberry lay on a bed of grated dark chocolate. This little gem looked so cool, a lightly dimpled outer shell that mimicked a real strawberry made of crystallised strawberry syrup. When given a healthy tap with my spoon the shell shattered revealing frozen pink sherbet. 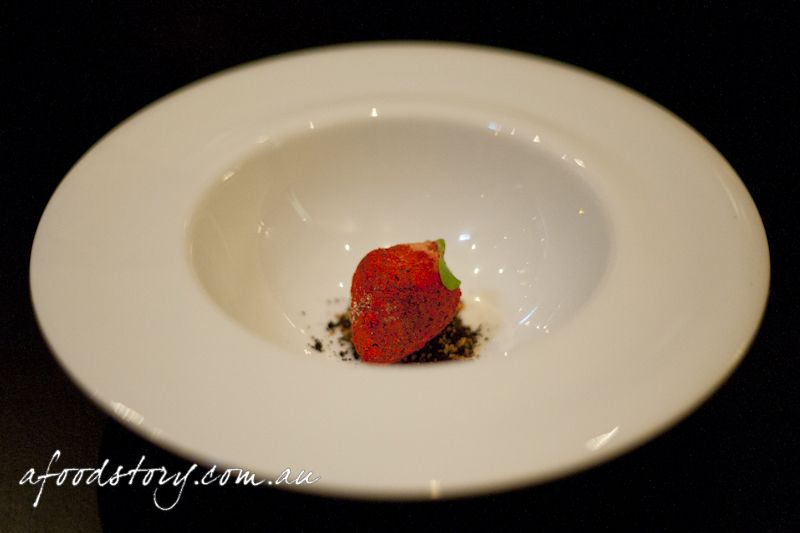 Such a marvelous dessert concept; freezing cold, big strawberry hit, soft tangy sherbet and overall heaps of fun to eat. 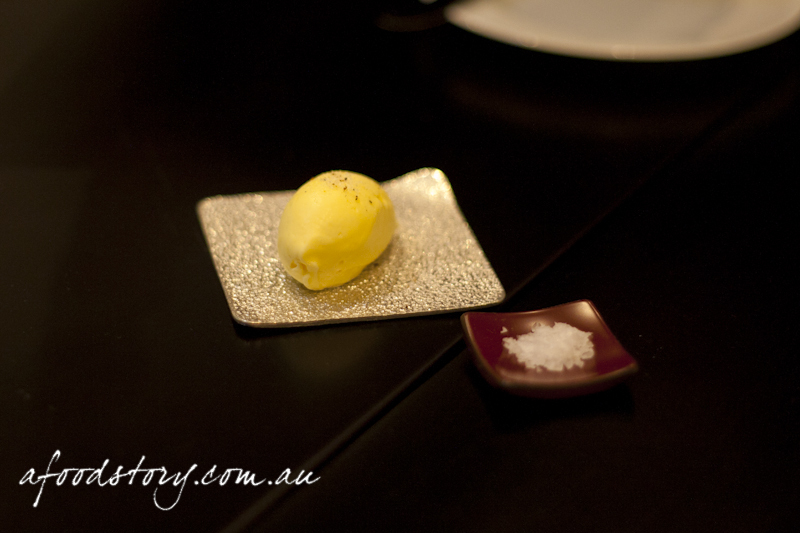 Pre dessert – Vanilla, custard apple, gingerade. On our last visit we got to experience gingerade and all came away impressed with the palate cleanser. Em had her fingers (and toes, and everything else) crossed in hopes that we would be served this once more. Luck was on our side as the larger pre-dessert version arrived. Gingerade on steroids perhaps? Hidden beneath the soft white gingerade was a silky smooth vanilla cream and some nice custard apple that made this definitely more a dessert than palate cleanser. “Autumn chocolate forest” – Soft chocolate, chestnut and praline cream, lavender custard, blackberry sorbet, pomegranate jellies, green tea, licorice, chocolate twigs, berries, crystallised fennel fronds. 2009 Mas Amiel ‘Cuvée Spéciale – 10 Ans d’Âge’ Grenache Noir, Maury, France. Funnily enough, other than the sashimi dish this was the one that I was really looking forward to. The photos I had seen of it looked epic but as it arrived I was amazed at the level of detail in all of the elements. Prominently sitting atop of the carefully constructed dessert was a quenelle of the most intense blackberry sorbet imaginable, but as with all of our courses during the evening ever other element was able to compliment it so well it was never out of place. Soft and creamy chocolate, mild lavender custard, playful jellies of pomegranate, meticulously crafted twigs of dark chocolate dusted in cocoa, fennel fronds that were sweet and crunchy adding to the other licorice flavours present and a velvety ice cream just all melded into a truly inspiring dessert. 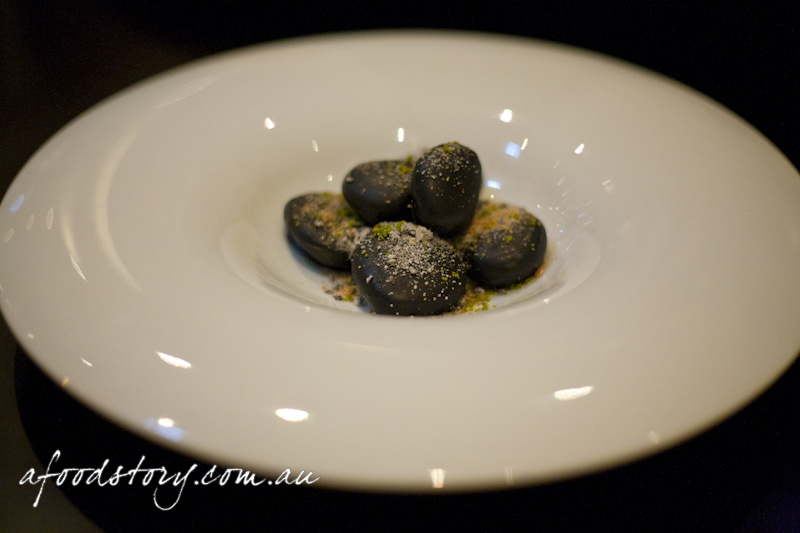 “Japanese Stones” – Chocolate, coconut, cherry. With dessert finished we were all content and ready for a macchiato (well not Em as she hates coffee) when once more the kitchen treated us to something special, the ever impressive “Japanese Stones”. Everyone seems to love these things, and why not, they look picture perfect, they take hours and hours to make, they are made with some pretty special cooking techniques, and when you finally stop admiring them and decide to eat them they taste utterly sensational. Coffee and tea, petits fours. Wow, after the stones I really felt like that coffee as it seemed the tipping point had been reached and I could not contemplate eating any more food. Well, except for the petits fours of course. 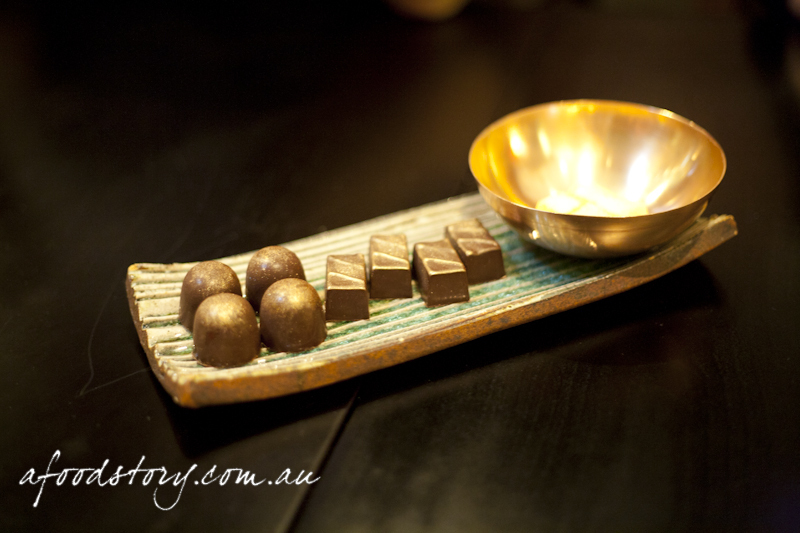 There were Meyer Lemon jellies sprinkled with tea sugar, chocolate covered caramels and chocolate covered almond praline. That was definitely it, I was no longer able to eat or drink but that was fine as I had just experienced one of the best meals of my life. 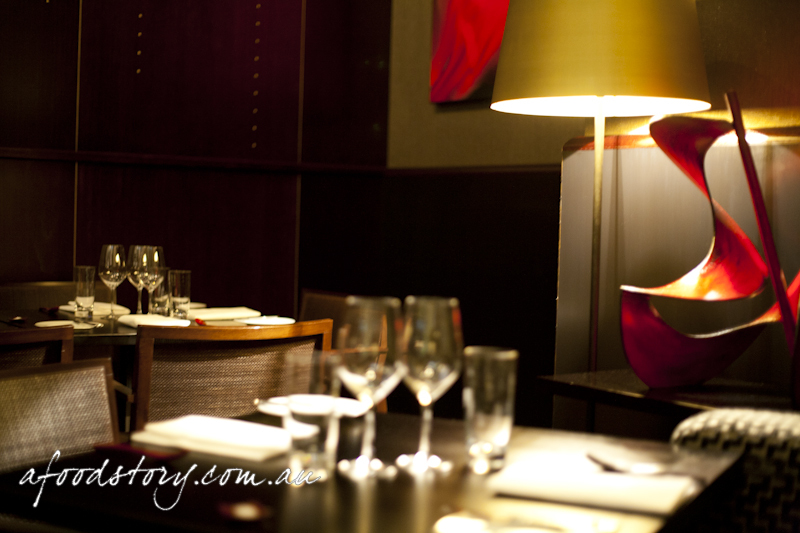 The staff were totally amazeballs and it was great to chat to Vicki at the end of the meal about our thoughts on the dishes and how we felt about the degustation. 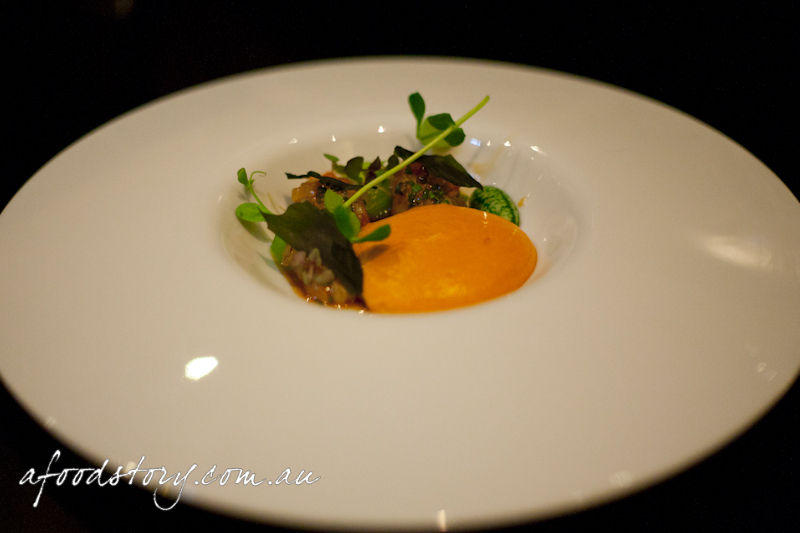 It was all thumbs up from the four of us and we were all together in saying it was the first degustation we had experienced where there was no single dish that under-performed in any way, just winners the whole way through. A HUGE thank you to the entire Sepia crew for making this such an unforgettable evening. LOVE Sepia! everything looks fabulous, how amazing is the chocolate forest! Without a doubt the best food I have ever eaten. 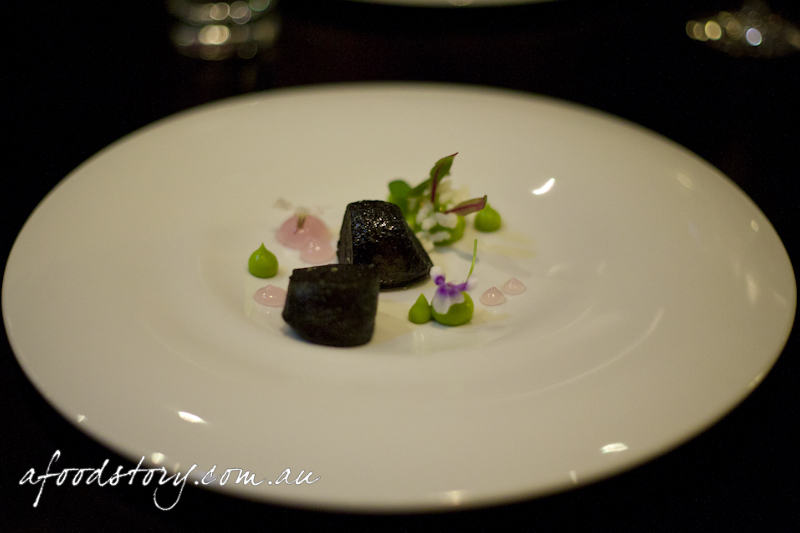 Although I think Rockpool is still my number one “experience”. ive always wanted to try the japanese stones as well! but wow, i thought that was an actual strawberry! Hi there, Agreed, Sepia is amazeballs. 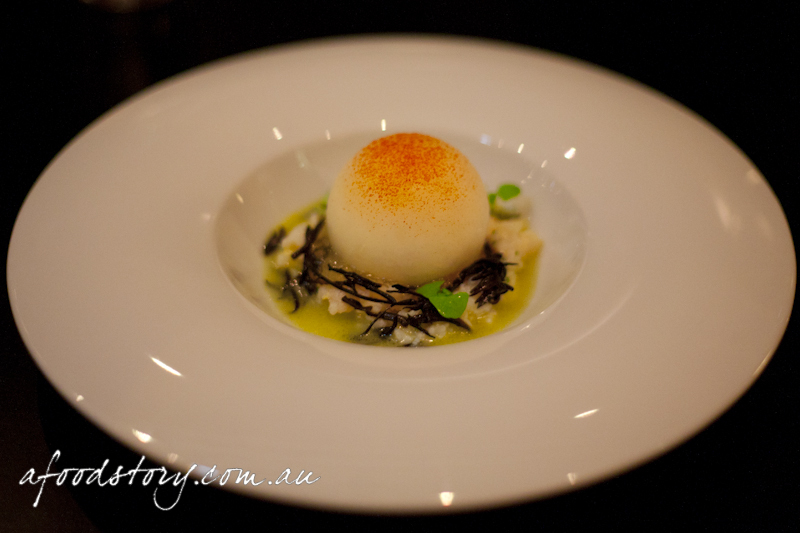 We had the degustation there last year and it was one of the finest meals of all time 🙂 Re: allergic reactions, RPA has a very good allergy unit you can get tested at. You should get that reaction checked out. I take a antihistamine when I want to eat a special meal that will include duck or seafood for my special food requirements. Enjoying your blog, say hi to Lex. Even the butter is photo worthy!